How Do Dentures Compare To Dental Implants? There are countless reasons for tooth loss, including gum disease, large cavities, accidents, genetics, poor hygiene and age. Unfortunately, despite the many reasons for losing teeth, dentures were the one and only way to replace them for many decades! Then implants came along and changed dentistry forever. If you’re trying to decide between dentures and dental implants, you probably have some questions about which option is right for you. Below you’ll learn about the main difference between them and the pros and cons of each! What Is the Key Difference Between Dentures and Implants? Dentures only replace the crowns of missing teeth (the white portion that you see above the gumline), while implants replace the roots. These replacement roots account for all the advantages of implants, such as dramatically improved chewing power, stability and function. Implants also trick the body into thinking that teeth are still present, so the jaw bone doesn’t shrink over time the way it will with dentures. More affordable initially. However, dentures must be replaced periodically because they don’t last as long as implants, which increases the long-term cost. Modern dentures fit better than older versions and can provide a natural-looking result. Many hard, crunchy, or tough foods are difficult or impossible to eat with dentures, such as corn on the cob or steak. Dentures can be fragile and might break if dropped. Bone loss will occur in your jaws over time, changing your facial structure and appearance. Dentures can become loose and start to slip during meals or conversations, which requires periodic visits to have them adjusted. Won’t look or feel as natural as implants. Dentures typically need to be replaced about every 5 years. 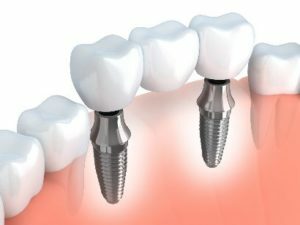 What Are the Pros and Cons of Implants? Implants can last decades, or even a lifetime, with basic care and maintenance (i.e., regular brushing, flossing and checkups). Your bone mass and facial structure will be maintained and your implants won’t become loose or start to shift. You’ll have almost the same chewing power that you had with your natural teeth, so you won’t have to avoid certain foods. Implants require 3-6 months to fuse with the surrounding jawbone. Although implants require more time and money upfront, they last much longer than dentures in the long-term and are a much more permanent replacement option. Having said that, the best way to determine whether dentures or dental implants would work better for you is to schedule a consultation with a dentist in Plano. Losing teeth, regardless of the reason, can negatively affect every area of your life. But with modern dentistry, you have multiple ways to restore your smile and enjoy all the benefits that go with that! Dr. Afshin Azmoodeh knows that restoring someone’s smile after they’ve lost teeth dramatically improves their overall quality of life. He always thoroughly evaluates each patient’s circumstances so he can recommend the best replacement option for them. If you’re trying to decide between dentures and implants and still have questions, he can be reached at his Plano dental office, Legacy Trails Dental, his website or at (214) 227-1000. Comments Off on How Do Dentures Compare To Dental Implants?